After warm winter and windy autumn, people somehow look forward to chilly winter and all that it brings: crisp snow, cold weather, and of course, Christmas décor. Summer is all about beaches, fruit, sand, and pool accessories, autumn is all about Halloween and falling leaves, but winter is something else. Read on to discover easy DIY winter décor ideas you can use to make your home more beautiful this winter. Garlands are the best because they are easy to make and even easier to use as décor anywhere in your home: shelves, Christmas tree, windows, or even your house plant. 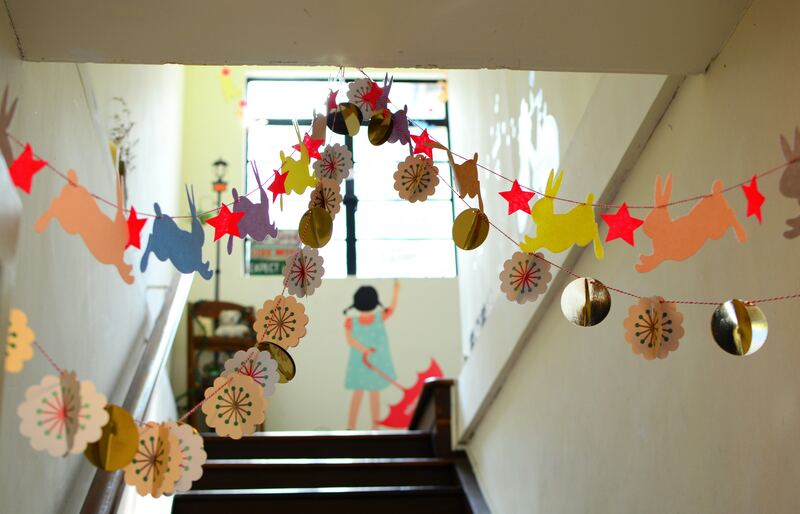 Children love getting creative and making garlands out of different things so you can try with popcorn or pom pom garlands. While for the first ones you only need (an abundance of) popcorns, needle, and some string, but pom pom garlands are much more durable, incredibly easy to make, and they can be re-used for another purpose afterwards (for example for a birthday party). You can also add red and white straws that look like candy canes to add some holiday colour. A great project you can make with your children and get a beautiful set of unique ornaments you’ll love. You need some tacky glue, water balloons, glitter, and some plain white string. Blow up the balloons, wrap them with string, dip them in glue, and sprinkle glitter all over them. After that, hang them so they can dry and the glue can harden, and when they’re ready, hang them on your Christmas tree, place them in a bowl on your coffee table, or you can bring in some branches from your yard, display them in a case in the corner of your living room, and decorate them with your glittery snowballs. Windows are your connection to the outside world, people on the street will always notice your window decoration, and for those looking out, intricate ornaments will brighten their day. Hang red and gold curtains and use snow frosting spray to draw snowmen and snowflakes on your windows. You can also use colourful stickers, pixie lights, and even hang small wreaths too. Decorate the windows in your entire home: in your living room, kitchen, and especially in your children’s rooms. Wreaths are the best because you can hang them on your doors and windows all year long, you only need to pick the right design. While autumn is all about falling leaves, pumpkins, and apples, winter is about snow, sparkle, and Christmas ornaments. You can easily make your own wreaths by stacking Christmas ornaments of different size and colour onto a wire hanger. The best thing is that you can be as creative as you like: you can add glitter, glue on small toys, add bows, pine cones, and burlap bows. Winter is the best time to take out all our old blankets and sweaters and put them to good use. You can make your own quilts, use old sweaters to make soft new pillowcases, and even use sleeves of sweaters to wrap your vases and make them more winter-y. You might hesitate to make too many decorations in fear that you won’t have a place to store them afterwards, but you can always get a Supereasy Storage unit and stack boxes of winter decorations until the time comes for you to use them again. Not only are pinecones easy to find, but they are also easy to use as decoration. Simply dip them in glue and sprinkle glitter over them to turn them into frost-kissed beauties. You can also try painting them white or using snow frost spray so they look like they’re covered in snow and you just brought them inside. Glue small velvet ribbons to them and hang them from your chandelier or your fireplace – it will make the place more magical. Every season has something magical about it, but winter is by far the most magical of them all. It is the time when the whole world seems asleep, snow-covered and silent. This is the time to let your imagination and creativity go wild and transform your home into a small oasis of comfort and warmth amidst cold.